It should be scarcely necessary to mention where London is, or how imporant it is in Britain and indeed, the world. It is the capital of the United Kingdom, and it's rich history is evident everywhere you look. 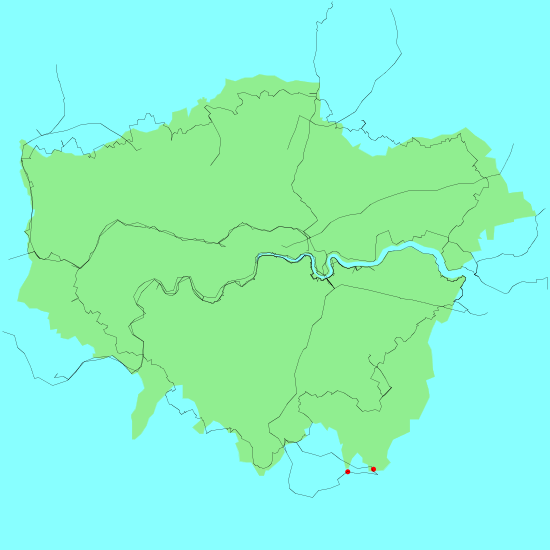 Greater London is formed from the old county of Middlesex, which was samped by the urban growth of London, and was fianlly subsumed during the local council reorganisation in 1965. Althouth there are many treasures to be seen in London, on a nice summer's day perhaps the best way of getting a feel for the city is to walk around it, which is surprisingly safe in most areas. One of the things that has always amazed me about London is the amount of greenery in it, from the Royal Parks in the centre to the larger parks in the outlying areas. The Thames Path national Trail runs from west to east through the county (and indeed the centre of the city), and the North Downs Way national trail makes an appearance in the very south. There is also a loop walk, the Capital Ring, around the outlying areas of the city. Ther are also several canal walks, including the Regent's Canal in the centre of the city, the start of the Grand Union Canal from Paddington and the Lea Valley Canal in the east. Below is a map showing all the walks that I have completed in London. This was a total of 540.7 miles in 29 walks (an average of 18.64 miles per walk).